NETWORK FINALS: NBC’s NFL game adjusted to 2.5 in final numbers. Elsewhere, time is running out for ZOO, which fell 0.1 to a dreadful 0.4 (especially after a 1.9 lead-in from BIG BROTHER), and the WHOSE LINE IS IT ANYWAY rerun also lost 0.1. CABLE HIGHLIGHTS: TBS’s THE GUEST BOOK started well with 0.45 for the first half of its back-to-back premiere, but it was down to 0.33 by the 10:30PM episode. 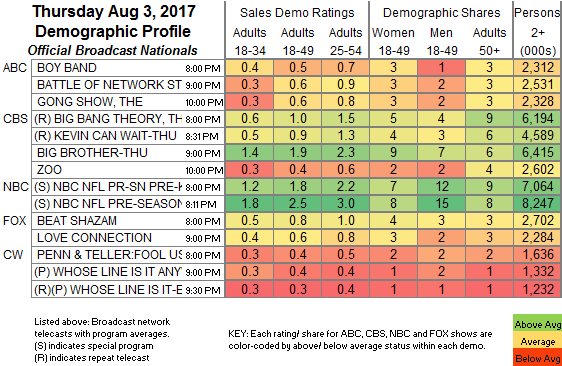 Discovery’s NAKED & AFRAID returned from Shark Week at 0.32, and lead-out DARKNESS premiered at 0.19. Viceland’s first scripted series WHAT WOULD DIPLO DO premiered at 0.03/59K. 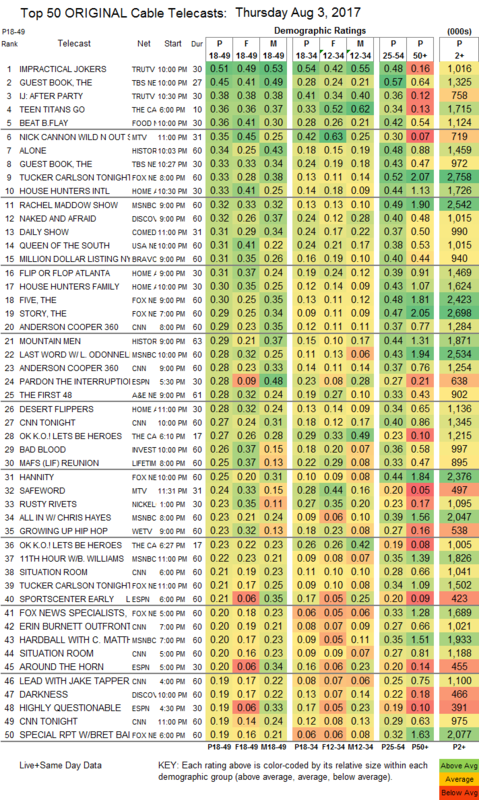 Tru’s IMPRACTICAL JOKERS jumped 0.12 to 0.51 for the Thursday cable lead, and it added an AFTER-PARTY lead-out at 0.38. Cartoon Network’s 6PM TEEN TITAN GO continues to garner primetime-level ratings at 0.36. Food Network’s BEAT BOBBY FLAY rose 0.07 to 0.36. MTV’s WILD N OUT fell 0.07 to 0.35, and SAFEWORD was down 0.11 to 0.24. On History, ALONE dropped 0.05 to 0.34, and MOUNTAIN MEN was down 0.06 to 0.29. A primetime Presidential speech put Fox News’s TUCKER CARLSON TONIGHT on top of cable news at 0.33/2.8M, with MSNBC’s RACHEL MADDOW SHOW at 0.32/2.5M, and CNN’s ANDERSON COOPER 360 at 0.29/1.3M. On HGTV, HOUSE HUNTERS INTL lost 0.05 to 0.33, FLIP OR FLOP shed 0.09 to 0.31, and HOUSE HUNTERS FAMILY was at 0.30. USA’s QUEEN OF THE SOUTH dropped a tenth to 0.31. Bravo’s MILLION DOLLAR LISTING ticked up to 0.31. ID’s BAD BLOOD gained 0.04 to 0.26, while MURDER AMONG FRIENDS was down 0.04 to 0.17. On Lifetime, a MARRIED AT FIRST SIGHT REUNION special was at 0.25. We’s GROWING UP HIP-HOP ticked down to 0.23, and BOSSIP was steady at 0.14. On E!, BOTCHED fell 0.05 to 0.19,. On CMT, NASHVILLE lost a tick to 0.15 (lead-out DALLAS COWBOYS CHEERLEADERS was at 0.09), and on Nick At Nite it was at 0.18/487K. Comedy Central’s THE PRESIDENT SHOW ticked down to 0.14. Spike’s THE MIST was down 0.02 to 0.11. POP’s IMPACT WRESTLING held at 0.06.